September has come to an end and Cart2Cart Team as usually wants to emphasize on the best articles of the month. Which topics have been the most discussed and what tips bloggers recommended to perform for e-Commerce entrepreneurs? 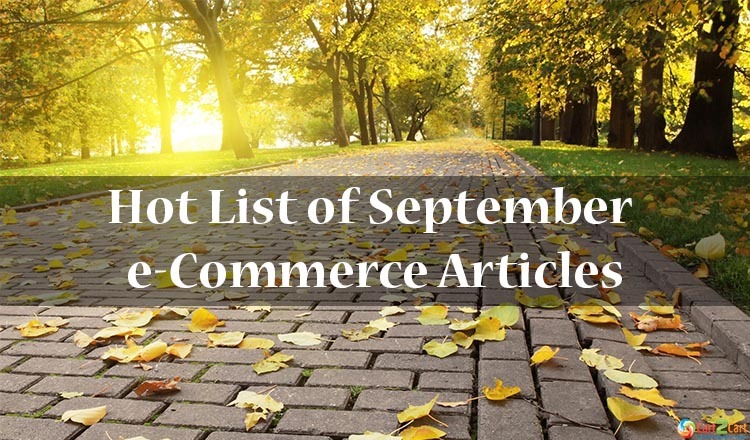 Check the list of popular blog articles of September and get a portion of useful hints. Each year brings a diversity of novelties and trends that become a must to be followed. Your store needs to be competitive and attractive for clients being in step with the times. Keep an eye at the tendencies of the next year and make the sales grow easily. And a hand of help for you is AheadWorks blog that offers a great article 2015 E-Commerce Trends: What to Expect providing a possibility to be aware of all changes and not to be surprised. Together with trends, you need to pay more attention to details as each and every element counts. Adding a live chat to your web store or free shipping offer can be really important thing that will improve business and please customers. Just put yourself in client’s place and think whether it would be nice to receive a thank you card after making the purchase. No doubt that it can impress and keep an interest of customers. Therefore, explore 7 Little Things to Improve an Ecommerce Business and let clients know how much you appreciate them. Do you know how the way we make purchases has changed over the past century? Check an infographic How People Buy: The Evolution of Consumer Purchasing to have a clue about the decision-making progress and changes. Have you ever considered Analytics as one of the most important factors for successful e-business creation? It helps easier to extend the pool of your customers defining the target audience with the major statistics. Have a look at an article HOW TO: Use Analytics and Research Before & After Opening an Online Shop and develop your business at ease. Are you willing to know How to get a #BetterBackend and pump up sales? Just glance at Bigcommerce blog article to discover the methods of keeping your e-Commerce in shape. Enjoy! If you offer a variety of cool products, but your product pages are not catching customer’s attention, then there is a chance to miss the boat. Improve web store content and design with the help of key items suggested in 5 Examples of Ecommerce Product Pages That Convert. Find out how to build an audience of customers for your brand using Instagram with video tutorial offered by Shopify blog. There are three efficient ways that can engage and add followers to your web store making it more popular with increasing sales rates. No need to present one more social network that appears to be leading among dozens of others. Presenting your business in Facebook you allow the store become more visible for global community. However, how to create and manage perfect Facebook page for business? Check Buffer blog post and reveal the secret. Cart2Cart Team hopes that you will find the riddle that can help to enhance your store. Keep an eye at the latest information about e-Commerce news and get the desired highs!